To the number of the most sought after watch brands in street fashion circles, famous Japanese manufacturer Casio ‘s G-Shock series is definitely among the best fashion lovers almost hand a Recently, Casio G-Shock also brought two new Solar Military watch. 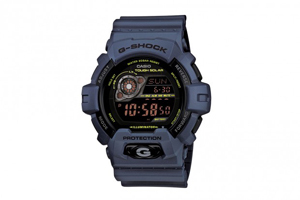 In addition to begin with matt navy blue color rendering is also equipped with a G-Shock Tough Solar proud of solar-powered technology and 200 meters waterproof set. GR7900NV-2 is the best choice for adventurous friends with a button in the G-Shock series has excellent cold resistance, equipped with a tidal display table cover screws revealed somewhat the tough personality; from the military form GR8900NV-2 inspiration, with LCD display and LED light auxiliary, in addition to the power-saving mode is one of the selling points.